How do you mitigate – or even avoid – a crisis, protect your brand, keep senior leadership on message, develop strategy or drive new business? With broadcast media monitoring, you’ll excel at every one of these challenges – and much more. With broadcast media monitoring, you stay on top of everything that airs on TV or radio about organizations, people, companies and topics. Public relations professionals, politicians, businesspeople and journalists use it to track the broadcast news mentions that matter most to them. Among all the media available to consumers today, television remains the most powerful communications medium. That’s because people spend several hours a week watching live TV, making broadcast coverage an excellent way to increase brand awareness and drive more sales. Even as social media usage increases, research shows TV is still the primary way most people get their news. For example, 88% of voters tracked the 2016 election returns on television, compared to just 48% who monitored social media, says the Pew Research Center. And viewership of live TV news continues to increase, reports Nielsen. Wherever they live or work, people want to know what’s happening and how it affects them. That’s why they seek local broadcast news sources to tell them about community events and news that affects their daily lives. Adults spend more than twice as much time watching local broadcast news programming – two hours and 22 minutes a week – than they spend watching national broadcast news. In addition, there are more ways to consume broadcast programming today, including via mobile devices and over-the-top services. According to Nielsen, live TV along with DVR/time-shifted TV has a weekly reach of 214 million adults, while TV-connected devices, such as game consoles, reach 106 million. Other popular ways to watch broadcast programming are via smartphone video (110 million viewers) and on computers (78 million). One takeaway from this data is that as long as TV dominates media consumption trends, PR pros need to know each and every time their brand or client is mentioned on broadcast news. To stay on top of mentions, they need to invest in a video monitoring service. Organizations that don’t monitor conversations about their brands put themselves at risk of missing those crucial five minutes. So, if TV coverage is a core component of your communications, marketing and business strategies, then brand monitoring should be one of the most important tools you use to stay on top of your mentions in broadcast media. One advantage of ongoing brand monitoring is that it enables you to keep your finger on the pulse of conversation. You’re instantly alerted to what media influencers are saying about your brand, giving you the opportunity to respond quickly. Brand monitoring provides the information you need to amplify positive messages or address erroneous or negative information. No organization is immune from a crisis or emerging issues. In fact, it’s common for businesses to face more than one crisis at a time, which puts executives and communications teams under great pressure as people and resources are limited. Executives will be required to make swift – and perhaps expensive – decisions about strategy designed to contain the crisis. Communications specialists will develop and orchestrate the delivery of key messages to relevant stakeholders. They’ll also coach spokespeople and correct inaccuracies in media coverage. Fortunately, crisis management is made easier with media monitoring. As a crisis unfolds, time is of the essence. Staying on top of news within moments of a broadcast enables PR pros to reach out to journalists to provide background, correct facts and offer key spokespeople for interviews. At the same time, executives benefit because broadcast media monitoring helps them understand the full scope of any damage, which leads to better decisions. Whether it’s in a crisis or a segment you pitched, your spokespeople need to be well-prepared for a TV interview. They should be ready to answer any question smoothly. A broadcast media monitoring tool will increase the effectiveness of your media training sessions with executives and clients. These three media training tips demonstrate how to use clips in training to boost your spokesperson’s performance. Build a library of real appearances to make your advice more tangible. This is especially effective when training the same executives because it’s a great resource to show improvement over time. Use clips to visually demonstrate what makes a good interview vs. what makes a bad interview. During training, point out the impact of clothing choices, makeup, posture and body language. Before the next big TV appearance, use clips from their most recent appearances to discuss what worked and what didn’t and to provide tips to improve delivery and fine-tune messages. Strong results don’t just garner accolades. They also help businesspeople land big promotions and accelerate their careers. But many professionals may not realize how broadcast media monitoring can move their career forward – beyond its role in proving their value. The importance of monitoring TV coverage isn’t overrated. Here’s how ambitious employees can use it to elevate their careers. Be first to identify story ideas and potential clients. Stay on top of developing news in target industries with news alerting. With little effort, PR pros can identify compelling news angles and hooks to use in pitching. In addition, monitoring helps PR and marketing agency teams spot potential clients with an urgent need for strategic advice or who might need extra resources to manage a crisis or competitive threats. Provide valuable insights to strategy. 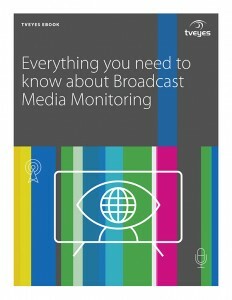 Broadcast media monitoring is a critical resource for strategists across the organization. Industry and brand coverage analysis provides insights that lead to smarter strategies and campaigns. Executives are better prepared to provide well-considered advice to the CEO, as well as bring new ideas to the table. And upon execution of your plan, it provides the proof that your efforts are working. Bring new client pitches to life. Monitoring TV coverage is also important for strategists, communicators and agency teams because it provides analytics about emerging industry trends. These insights help you formulate a viable strategy and show executives and clients why your recommendation is the right one. Adding video to an internal presentation also brings your ideas to life and makes it more memorable. Incorporate video of TV coverage to visually make your points. Executives are more confident with strategic decisions when they have a comprehensive picture of the industry and media landscape. Communications teams can control potentially damaging media coverage by keeping their finger on the pulse of slow-burning or emerging issues. Marketing and product teams can benchmark performance against the competition, keeping close watch on new campaigns and product launches. Compliance teams can monitor adherence to regulatory requirements and manage risk effectively. PR professionals can use segment clips to enhance media training so that spokespeople consistently perform above expectations. With so many different uses across the organization, the best broadcast media monitoring services solution for your specific needs isn’t always obvious. Business teams of all sizes and types need fast and easy access to coverage about the brands they promote. But the plan that works best for a midsized regional PR agency is going to be very different from what the marketing team at a global corporation might need. For example, a small PR agency with several regional clients will require a very targeted tool that monitors every local station and news program. For these firms, bigger isn’t better – and could even be next to useless if the service only covers national and cable TV. Meanwhile, a multinational organization must meet the local coverage needs of marketing teams in numerous countries while also providing access to crucial global news sources. Comprehensive coverage is a requirement. When choosing the best broadcast media monitoring services solution, here are the top questions to consider. How many media markets does your business cover? Be sure to choose an option that covers the media outlets most relevant to the markets in which you conduct business. How much TV coverage do you receive? Choose an option that fits your clip volume. Don’t pay for clips you don’t need and be sure to choose unlimited packages if you frequently download coverage. Choose an option that offers usage commensurate to your coverage volume. Make sure you’re able to view and download without having to worry about running up against a monthly limit or pay-as-you-go becoming a budget buster. How often do you access older coverage for media training or benchmarking? Agencies frequently use archived clips for media training, while regional competitive intelligence teams may only be concerned with current analysis. There’s a lot to consider when evaluating broadcast media monitoring solutions. To help you make your decision, check out these resources from TVEyes. These guides and checklists are the tools you need to make a strong business case and ask the right questions while evaluating your options. And if you’d like to take TVEyes for a test drive, we can set that up too. Here’s how to sign up for a custom FREE trial.